Club Penguin Cheats by Mimo777 Club Penguin Cheats by Mimo777: September Club Penguin Membership Page! 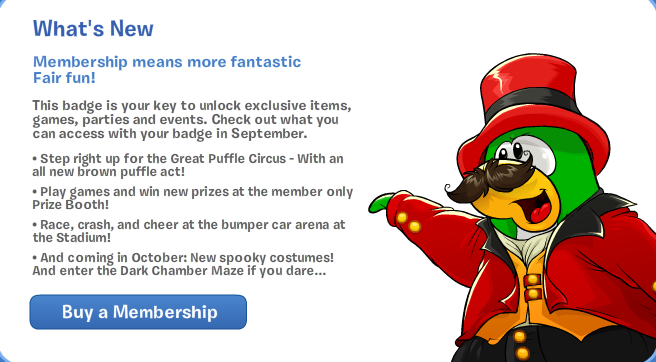 • Step right up for the Great Puffle Circus - With an all new brown puffle act! • Play games and win new prizes at the member only Prize Booth! • Race, crash, and cheer at the bumper car arena at the Stadium! Saweet! Bumper Car Arena at the Stadium sounds awesome! What part are you looking forward to most? the non member only party! I think I see a pair of puffle eyes in the bookshelf on the left side of the stage. Any idea what it could be? All the sweet prizes! I hope they're not all hats, and I hope that they're not all old. mimo im so exited i cant wait for the fall fair. im really exited. i also cant wait for the haloween party now! club pengun have got me super exited for everyfing! btw ur the best blog guy ever mimo.